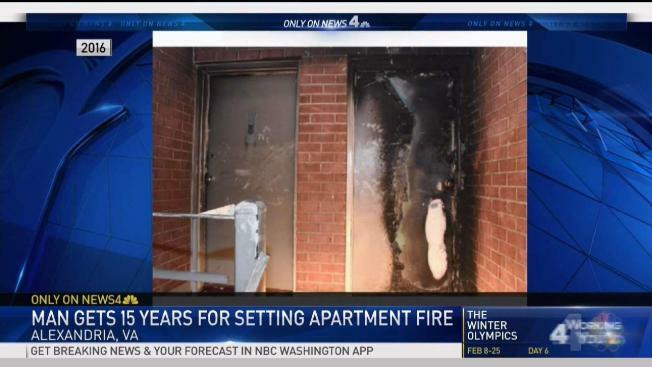 A man who was upset over a stolen iPhone threw Molotov cocktails into an apartment building in Alexandria, Virginia, trapping residents inside and leaving several people homeless. Federal court records reveal new details on why the building near Interstate 395 caught fire in June 2016. The arsonist, Josepha Kasai, was sentenced on Tuesday to 15 years in prison. Flames tore through the apartment complex on the 5300 block of Taney Avenue the night of June 21, 2016. According to evidence presented at trial, Kasai, 24, smashed a Molotov cocktail at the door of a third-floor apartment in the building. The doorway caught fire, trapping nine people on the third floor. Kasai then went outside and lobbed another Molotov cocktail at the building, breaking a window of the same third-floor apartment. A photo obtained by News4 through a public records request shows one of the devices, which appears to have been made with a wine bottle and a paper napkin. After Kasai firebombed the building, a victim in the third-floor apartment jumped from his balcony. Kasai chased the man with what appeared to be a knife, prosecutors said. As firefighters fought the flames, Alexandria police caught Kasai as he ran away along North Van Dorn Street, a few blocks away. The entire building was evacuated, and at least one person was hurt. Kasai later told law enforcement he had intended to kill the man who jumped from the balcony; he claimed the man had stolen his iPhone.